Synopsis : First, I'll tell about the robbery our parents committed. Then the murders, which happened later. In 1956, Dell Parsons' family came to a stop in Great Falls, Montana, the way many military families did following the war. His father, Bev, was a talkative, plank-shouldered man, an airman from Alabama with an optimistic and easy-scheming nature. Dell and his twin sister, Berner, could easily see why their mother might have been attracted to him. But their mother Neeva - from an educated, immigrant, Jewish family - was shy, artistic and alienated from their father's small-town world of money scrapes and living on-the-fly. It was more bad instincts and bad luck that Dell's parents decided to rob the bank. They weren't reckless people. In the days following the arrest, Dell is saved by a family friend before the authorities think to arrive. Driving across the Montana border into Saskatchewan his life hurtles towards the unknown, towards a hotel in a deserted town, towards the violent and enigmatic American Arthur Remlinger, and towards Canada itself - a landscape of rescue and abandonment. But as Dell discovers, in this new world of secrets and upheaval, he is not the only one whose own past lies on the other side of a border. 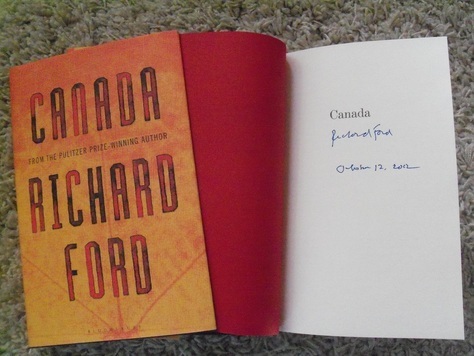 In Canada, Richard Ford has created a masterpiece. A visionary novel of vast landscapes, complex identities and fragile humanity. It questions the fine line between the normal and the extraordinary, and the moments that haunt our settled view of the world.